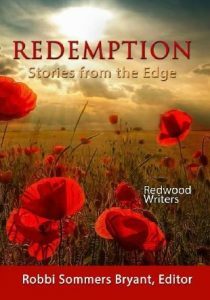 REDEMPTION: Stories from the Edge contains forty-seven tales written by Redwood Writers, which show how the act of redemption brings power to the powerless, insight to the self-absorbed, and hope to those who have lost their way. Through these fictional and true-life stories, the authors have shared their visions of the renewal of the human spirit. Purchase at Redwood Writers meetings or Amazon.com. 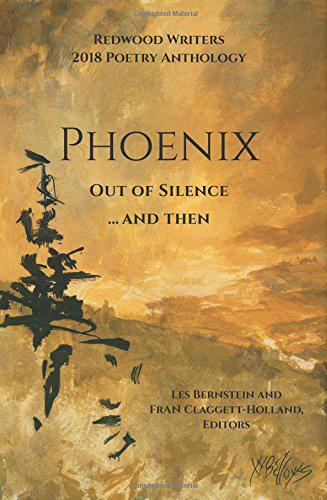 The 2018 Redwood Writers Poetry Anthology, Phoenix: Out of Silence ... and then, contains poems by a broad range of Sonoma County writers. In addition to about a hundred poems depicting the many aspects of life in Sonoma County, it has a special section devoted to poems rising out of the ashes of the devastating wildfires of October 2017. The wildfire poems depict what it was like before, during, and after the fires. There are poems written by a number of people who lost their homes and all their belongings. The anthology includes poems written by all of the Sonoma County poet laureates, many of whom were directly affected by the fires. Three poets received the Sonoma County Award of Merit distinction, and their poems open this special volume. 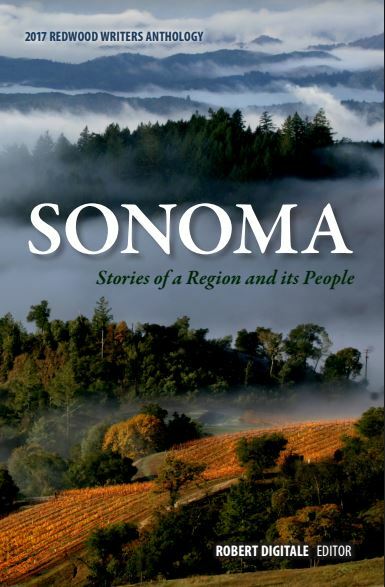 Delight yourself in this intriguing mix of stories from Sonoma County, California. Take in glimpses of little-known history: the Sebastopol temple that became a touchstone for the Japanese community here before and after World War II; the pioneering women's rights advocate who fought the forced retirement at age 32 of airline stewardesses; the county's lone lesbian bar in the early 1980s; and the daring race car driver and aviator who made the nation's first airmail flight here in 1911. This anthology from award winning local writers includes nearly 50 works of nonfiction, fiction and poetry. Each piece is set in a wondrous land of rugged coastline, river valleys, hillside vineyards, and redwood forests. And each tells a distinctly Sonoma story: the crestfallen young grape grower who learned his land wasn't right for the "King" of the vines; author Jack London’s dream to develop a new kind of farming operation in the Valley of the Moon; and the Santa Rosa ice skating rink where early morning practitioners could routinely catch a glimpse of “Peanuts” comic strip creator Charles Schulz. 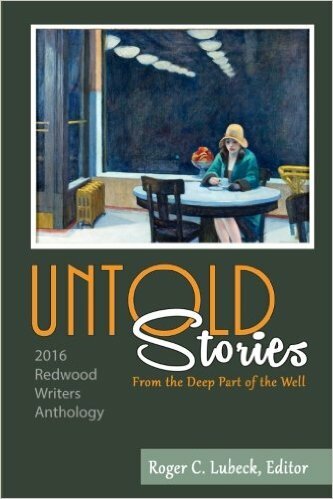 Untold Stories: From the Deep Part of the Well is a collection of 81 stories, memoirs, and poems from members of Redwood Writers, Redwood Branch of the California Writers Club. The stories and poems in this collection reflect the diverse experiences and rich imaginations of the Redwood Writers. In the collections, there are stories of life, death, love, and betrayal. Humorous stories and tales of murder. Personal memories of the 1960s and 1970s. There are accounts of "Bird Watching in Ecuador" and being "Down and Dirty on the Mekong River." In this exciting new collection, you will rediscover California, and grieve over the loss of a child, spouse, or lover. You will read about the "Thirteen Ways of Looking at Blackberries" and the comfort of "Mint Tea." You will read stories set in Asia, South America, the Middle East, a ghetto in Cleveland, a Delta forest in the Deep South, and in the cold of space. These are powerful stories and poems that illuminate the deepest parts of the well of human experience. 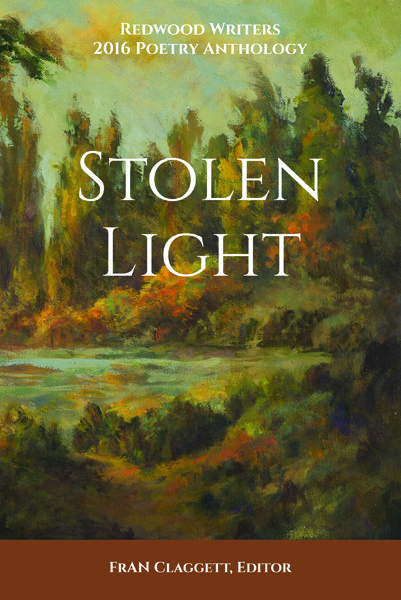 "Stolen Light," the title of Warren Bellows’ painting, gave us our title for this collection of poems by Redwood Writers, each representing a moment of light, of truth, of awareness, of all those small events that make up our individual ways of recording our days. The poets who have shared their own stolen lights have preserved in language those moments—of love, of loss, of the everyday events that we keep alive through poetry. Our poems reach out to the broader community and require only that you read with open minds and open hearts, as you might read in the middle of a redwood grove, with slanted light piercing the darkness and letting our poems illuminate moments in your own life. 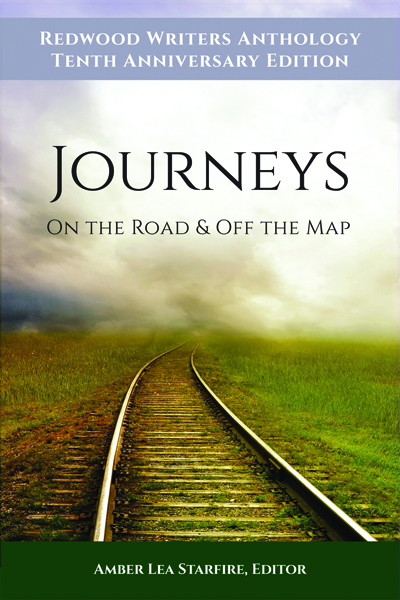 A collection of fiction, poetry, essay, and memoir created by the members of the Redwood Writers Club and inspired by the theme of Journeys. All journeys begin in one place and end in another, having elements of challenge, change, and transformation. We asked our members, “Where have you been? Where would you go? Bring us into the worlds of your journeys, real and imagined.” The result is a compilation of writing that explores the nature and adventure of life and how the paths we take shape who we are. We are poets of California. The poems in this collection capture the coast, the mountains, and the city. We are on the road and in our own hearts, a journey fueled by imagination and social commentary. We honor the Beats in this collection because so many of us were influenced by the works of poets like Di Prima, Kerouac, Ginsberg, and Snyder. Kerouac himself published the definition of the Beats in Esquire Magazine: "[the beats are] a generation of crazy, illuminated hipsters suddenly rising and roaming America, serious, curious, bumming and hitchhiking everywhere. Ragged, beatific, beautiful in an ugly graceful new way . . . Beat, meaning down and out but full of intense conviction." The beats asked questions with a different rhythm. They delivered answers with new syncopation, a rift of who went before while simultaneously creating something new. Our poets walk that line, balanced between everyday life and something wild. We invite you to take as many moments as you have, and swing with us. Go through eScript portal to support the Redwood Writers! The basis of all living organisms, water’s vital role is indisputable. Deeply connected to our humanity, in abundance or scarcity, water possesses the power to sustain life, to end life. From the literal to the abstract, water evokes imagery and emotion, movement and flow. 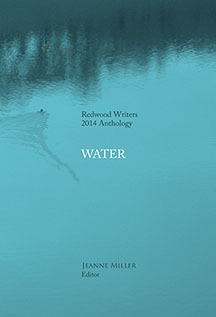 Available for $12 at the following: Redwood Writers meetings and events. Amazon.com: shop through the escrip portal to bring additional support to the club. Click here to download the Anthology Sell Sheet. 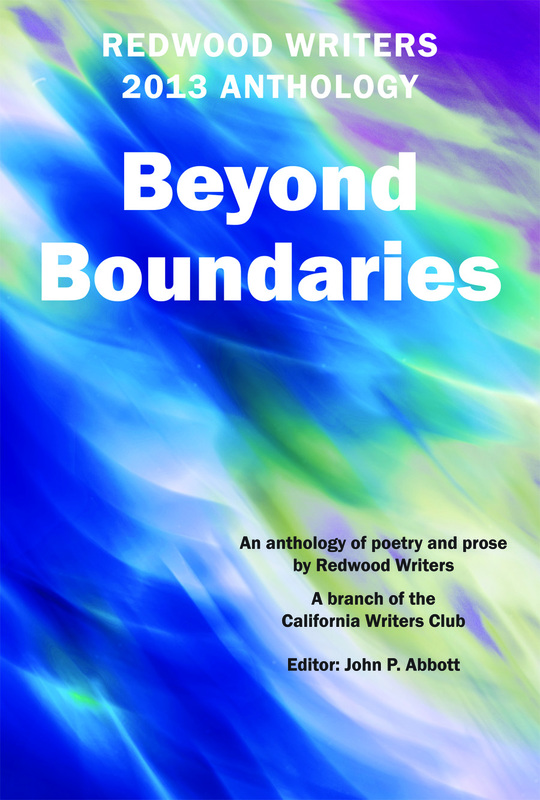 The stories, poems, essays, and memoirs anthologized in Beyond Boundaries take their inspiration from the theme of emancipation. Produced solely by the members of Redwood Writers, these collected works reflect our quest for freedom, the tyrannies large and small we strive to overcome, and the rush of exhilaration that liberty brings. Childhood memories...the sweetness and bitterness of life...the joy of love and the sorrow of losing it...the warmth of family and friends...the lure of the wild. It is all here in Vintage Voices 2012: Call of the Wild. 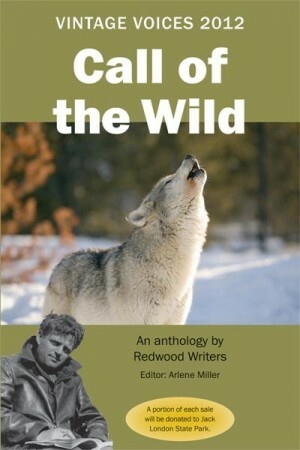 A collection of poems, memoirs, and short fiction, inspired by Jack London, and ready for you to enjoy. Amazon.com: Shop through the escrip portal to bring additional support to the club. For more about purchasing, click Vintage Voices 2012 Sell Sheet. A portion of each sale will be donated to Jack London State Park. 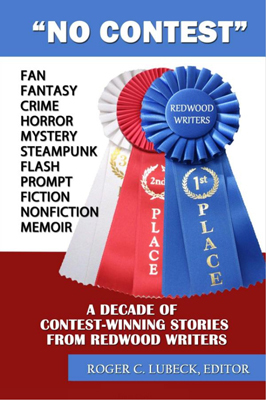 An anthology by members of Redwood Writers, these collected stories, essays, and poems reveal our human connection through common experiences, a connection that rises from the page and touches the reader's consciousness. Over 65 works represent the whimsical, alarming, funny, and sincere elements of life. Like leaves tumbling down, sent from deep roots, these stories and poems resonate with beauty and startling moments of life. Pick up books at monthly meetings and branch events. 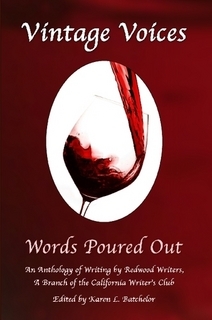 Vintage Voices: Words Poured Out is a full-bodied celebration of the written word. It’s an aromatic collection of short stories, poems, essays, and memoirs. Each piece has a distinctive flavor although, like wine, the pieces fall into loose categories. They are bold, strong, light, bitter or sweet. The stories are whimsical, thought-provoking, alarming, touching and sincere. The words on these pages will intoxicate your senses, tickle your taste buds, and have you wanting another sample. Price: $6 suggested donation—ONLY available at events and meetings. Open Vintages Voices: Four-Part Harmony to find a choir of voices harmonizing through poems, essays, short stories and memoir. While each voice is different, each is note-worthy. Our voices tell of growing up and growing old, our past and our present, and, most importantly, our connection to each other. Our voices are celebratory, poignant, humorous, or sad, yet the collective effect is a symphony in four-part harmony. 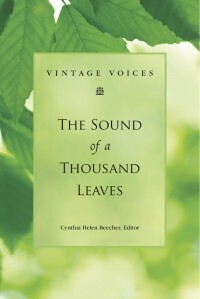 Vintages Voices: Four-Part Harmony can be ordered for $6 as an e-book or $11.95 paperback at www.iUniverse.com. Our collection is arranged to reflect the seasons in the vineyards, the same four seasons of our lives. Chardonnay: To the Planting presents the lightest wine and contains pieces about childhood and youth, the light and early years. Rosé: To the First Bloom celebrates youthful adventures and love. Zinfandel: To the Harvest tells stories of maturing reflections. Port: To the Bottling blends aged wisdom with the mysteries of life’s end.This anthology was made possible by the generous support of iUniverse. Its attractive cover and interior formatting were designed by the iUniverse professional team who gave personal attention to every detail. Purchase online at Amazon.com. This is an anthology including works written by members of Redwood Writers and includes a diversity of styles and genre. The book itself was crafted, designed, and published by Redwood Writers, a unique opportunity offered by Lulu.com. Its wine-drenched cover with an antique map, laced with grape vines, add to the charm of its content. The pages feature wide margins and double spacing that make each author’s piece easy to read and set apart from the others. Lulu.com generously assisted Redwood Writers in each phase of this production. Purchase online at lulu.com. 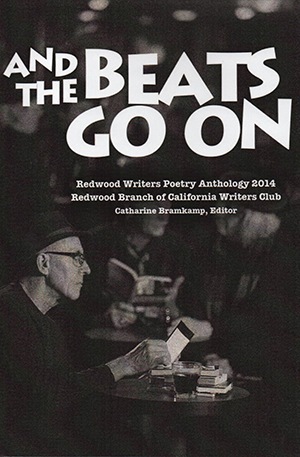 All anthologies can be purchased with a donation to Redwood Writers at most meetings and events.